The Holden Racing Team has announced a new deal for Garth Tander to extend his current 10-year tenure with the Walkinshaw outfit. The agreement, believed to have been a formality for some months, has been confirmed on the eve of Tander’s home V8 Supercars event in Perth. Tander has driven under the HRT banner since 2008, having previously spent three seasons at the sister HSV Dealer Team. The extension will take the partnership through until the end of 2016. The timeline coincides with the end of team-mate James Courtney’s current three-year contract, which was inked mid-way through 2013. “It’s great to sign a new deal with the Holden Racing Team,” said Tander. “It’s an exciting time for the team, with the structural changes made before the start of the season starting to bear fruit. 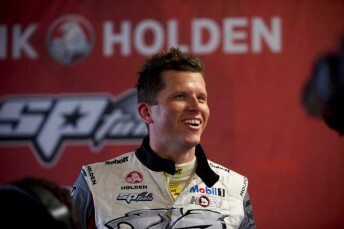 News of Tander’s contract comes ahead of confirmation of a continuation of the team’s agreements with Holden. Holden last week announced a two-year extension for its sponsorship of Triple Eight, taking that relationship through until the end of the car company’s local manufacturing in 2017. The HRT continues to invest heavily in staff and equipment in order to return to its glory days, highlighted by the poaching of Adrian Burgess from Triple Eight last year. While Tander took the championship for Walkinshaw Racing in 2007, the HRT side of the empire has not achieved the sport’s ultimate prize in 12 years. “We’re over the moon with Garth re-signing, and committing the next stage of his future, to the Holden Racing Team,” said Burgess. “Consistency within the engineering group and drivers is especially important for our long-term development. “As a driver, he’s the total package. He’s won over 50 races, including Bathurst three times, and he’s a champion. Burgess also stressed the strength of the Tander-Courtney combination, which had initially been predicted to cause sparks when the two first paired up for the 2011 season. “They’ve got a lot of respect for each other,” said Burgess. “They’re both highly motivated and determined, and don’t accept second best. In addition to the 2007 championship, Tander’s career has included three Bathurst wins (2000 with Garry Rogers Motorsport and 2009/2011 with the HRT). He has completed more ATCC/V8 Supercars Championship events in a Holden than any other driver, having raced for GRM from mid-way through 1998 until the end of 2004. Tander currently sits 14th in the 2014 V8 Supercars Championship, scoring his first top five of the season last time out at Pukekohe. The 37-year-old boasts 52 career race wins, although just two of those have come from his last 87 starts.